Just a couple of weeks before he turned 4 years old, Jacob Houck received a life-changing diagnosis. He had a very rare kind of brain tumor. Rich Houck, Jacob’s father, was told of this shocking and heartbreaking news by his wife and still remembers how it felt when that bomb was dropped. The tumor, an Atypical Teratoid Rhabdoid Tumor, is notorious for taking lives of kids before they even turn two. As such, doctors weren’t sure that Jacob would be able to survive. At just 4 years old, this doctors warned his parents that he may not have a very large amount of time left at all. But Jacob defied all odds and, today, he is 21 years old and very much loved by his brothers and parents. His whole family strives to make him laugh and smile and make his every waking moment a delight, because they know that the fact that he is with them today is a miraculous gift. Rich, Jacob’s father, is a former respiratory therapist, and he knows just about precious his moments spent with Jacob and the rest of his family are. 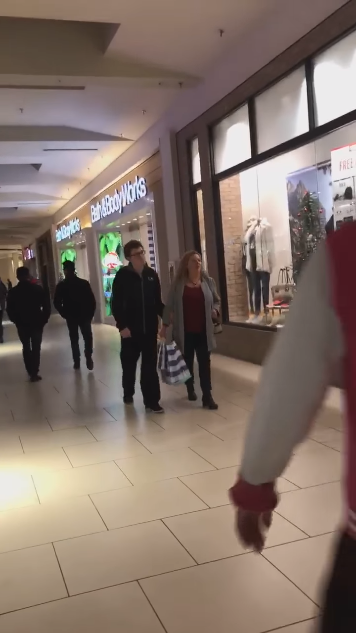 Just recently, he and his family took a trip to a nearby mall, and Rich decided to pull a hilarious stunt to make Jacob smile – a stunt that has since taken the Internet by storm! 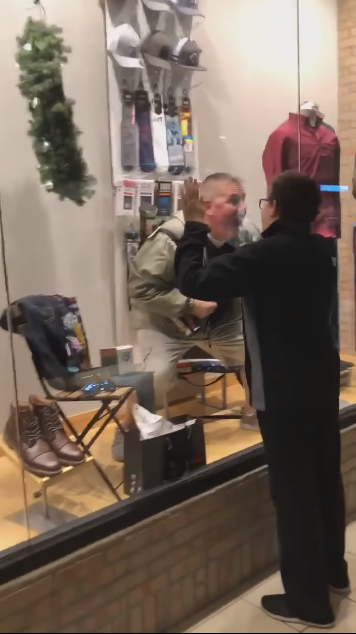 Rich walked up to a clothing store called Buckle and asked Nicole Prodin, who is the assistant manager, for a favor. He explained that his son has special needs and told Nicole that he wanted to make Jacob crack up with laughter. His request? 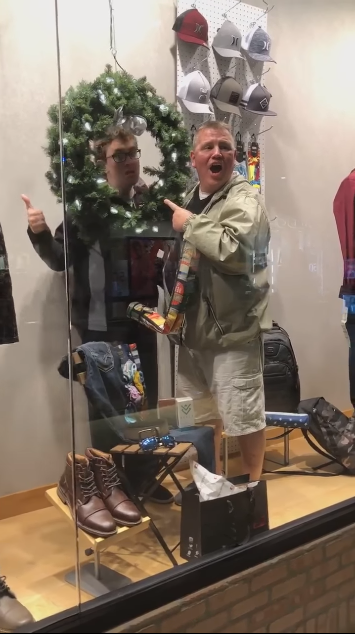 That he be allowed to pose in the window with the mannequins! Naturally, Nicole was a little taken aback, but she couldn’t say no to such an intriguing request! What followed was a moment both funny and touching. Nicole took a video of Rich’s antics and Jacob’s reaction and posted it on her Facebook shortly after! 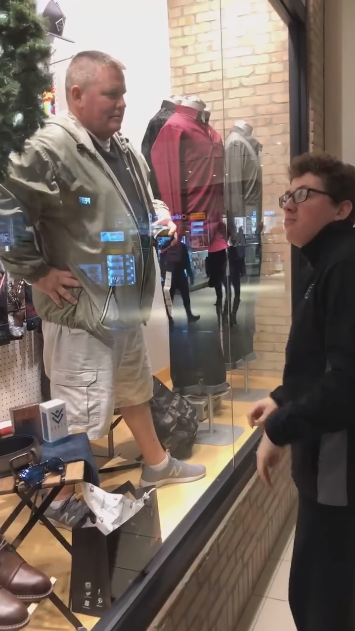 In it, we see Jacob, walking a little behind his mother, start looking around to see where his dad went before noticing him being silly in the store window! What Rich didn’t expect was for the whole mall to stop what they were doing and watch what was going on. 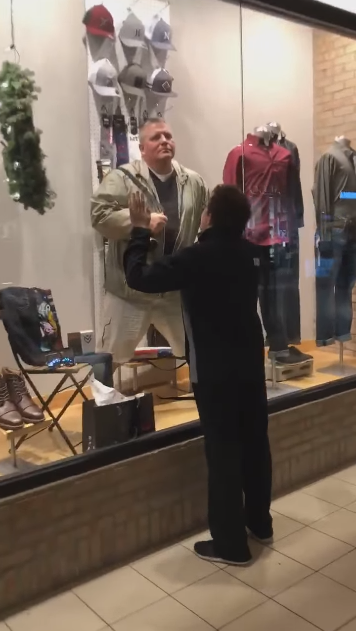 Shoppers seemed entranced by the goings on, and it put a smile on everyone’s face to see the lengths this father would go to for his son! Nicole herself had praise to sing of rich, calling him a great father and saying he made her night. The family had no idea that their cute interaction would go viral, but it’s given Rich a chance to speak about life with Jacob. He explains that every day with him is a gift, so he and his other sons are always doing silly things to make Jacob’s day just a little bit brighter! 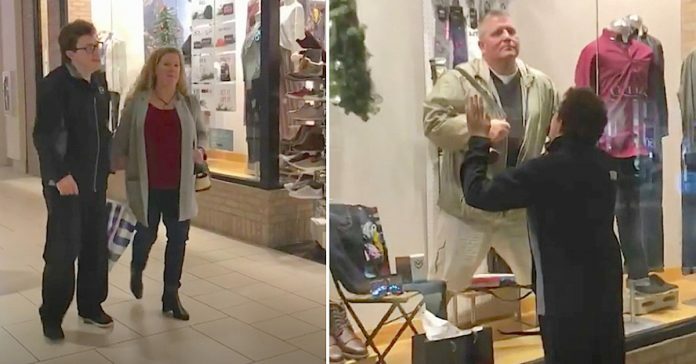 As far as he’s concerned, what he did at the mall was just him doing something for his son. This video is a great reminder that every day is a present, and to love and appreciate everyone we spend our days with!